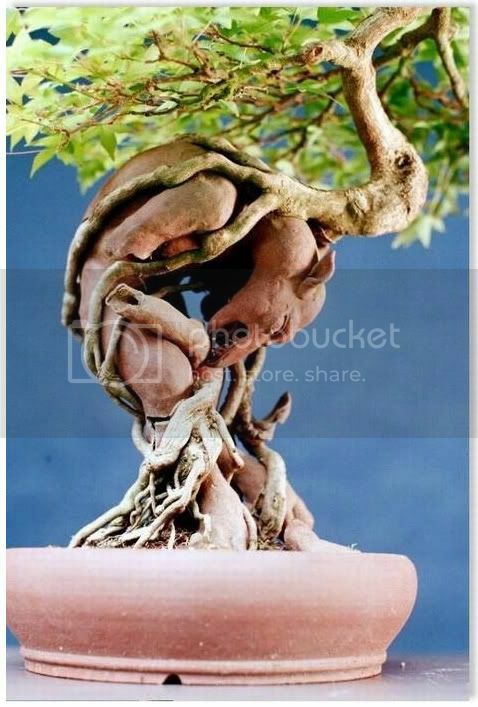 It may not be mainstream, but I quite enjoy the less formal bonsai - animal forms, growing over or around odd items. So that is quite cool. haha that's great! 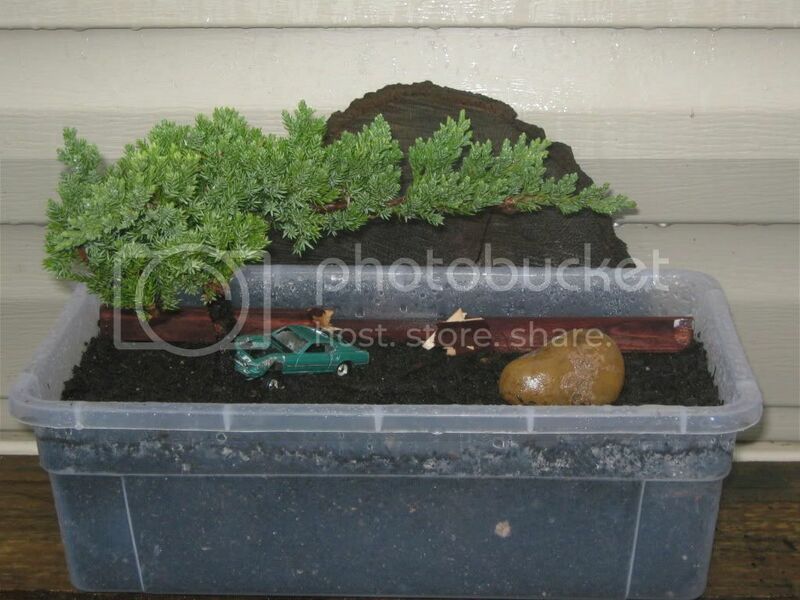 I'm thinking of doing root over rock one day but instead of a rock, using a toy car. when I'm more experienced though and I find material that's suitable for this. Kree;; You can never know too much about one thing. that sounds awesome, oh and welcome to the forum. yeah I just used a little Hot Wheel car but here in Texas they have little model cars like Hot Wheels but bigger I was going to use one of those but it was a bit to big anyways GOOD LUCK. GardenerX wrote: that sounds awesome, oh and welcome to the forum. ahhh well have you considered shoping online I haven't bought a tree online yet but I'm sure someone on here has and knows a good site to go to. yea I know what you mean. What an adorable idea =) And pretty inexpensive too! Once I started looking into it, there are a surprising number of bonsai accesories XD It really just gives them that extra personal touch I guess! That is too funny!! Modern day bonsai! To those who say "We can't afford to go green" I say "We can't afford not to". Nick Lenz does some cool things too. He has a forest group with a derelict old tank in it. And of course there is his demon maple. I want to make a root over rock with this demon skull. I was supposed to go to a workshop to set this up, but the weather was too nice and I wound up potting up some other trees at home. Haha sounds good. And I cna't wait to see what that skull will come out to look like. That demon maple is fantastic. 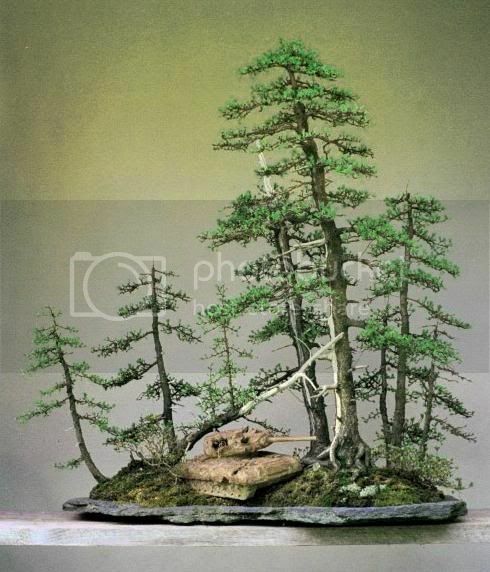 I feel that bonsai gardeners should "branch out" past the formal styles and be artistic in this way. Especially in the West (USA, Europe, etc.) where we need to make our own traditions and not feel bound to purely Asian ideas artistically.